Can I take the course on my iPad or iPhone? Yes. Our courses work on all smart phones and tablets. This includes iPhones and iPads as well as Android devices. Do I only get one course with my purchase? Yes. Each purchase includes one course. No. Your purchase is limited to single user access. For security reasons, your course purchase will include a login password to protect us from password sharing. Additional questions will be used during the course to ensure student personal authentication. Do I need special software to view the course on my computer? Yes. You will need Flash Player to view our course material. Most computers have this software preinstalled. If you are not sure, then download the latest Flash Player (FREE) by clicking HERE. After I purchase, can I print the course? No. All of our courses are only offered online. 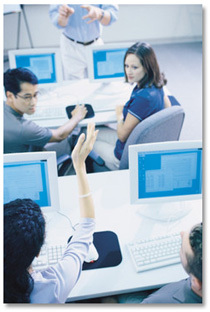 You can take your course from any computer that has internet access. Yes. Our site keeps track of every course you take, the answers that you select, and the scores for each exam. It also gives you performance benchmarks and lets you know instantly how you are doing in all areas. Yes. You can open and review your courses in your course history. During the exam portion of the course, you will be able to see your score instantly and view the answers you selected, whether you got them right or wrong. Yes. A course can be paused at any time for later use. When you are ready to continue your course, simply go into exam history, select your paused exam , and continue on. In addition, you will be able to log-in and log-out as many times as you like. You can obtain help by using the support link above or by sending a request to us via email at support@abbatraining.com or by calling 1.800.680.7176. Is Abba Training approved (certified) to offer CE courses in my State? You will need to log in to your user registration page to update your account, click HERE. You may change your personal information in your account profile online at any time. Will I receive continuing education (CE) credit when I complete my course? Yes. If you successfully complete all courses required by your State, then you will receive the appropriate credit. Yes. We have an easy to use affiliate program offering great return on qualified traffic that you send us. For more information, click HERE. Is there a completion policy? Yes. You have 6 months for CE Courses and 12 months all other courses from the date of purchase to complete your course. No refund or exchange will be allowed for expired courses. Yes. Students requesting a refund or exchange for an online course must do so within (15) fifteen calendar days from the order date to receive a full refund. No refunds will be granted for online course that are 25 percent complete. Students requesting a refund or exchange after (15) fifteen calendar days will not be refunded or exchanged. Is there a termination / access restriction policy? Yes. In case of irregularities, Abba Training reserves the right, in its sole discretion, to terminate your access to any or all of the site and the related services or any portion thereof at any time, without notice. Yes. All contents of the site are copyright by Abba Training. All rights reserved. All rights not expressly granted herein are reserved by Abba Training. What happens after I successfully complete my CE course? Immediately after successfully completing the course, we will issue a certificate of completion. You will be able to print and/or email the certificate from your personal exam page. Can I renew my CE license online? Yes. You will receive a copy of your invoice via email and you will be able to print your invoice from your personal information page. How long will you retain my course information? Abba Training will retain course completion records for a period of five (5) years after completion of a course. Can I get a copy of my course information? How long will my promocode stay active after I register? You have 14 days to activate your course after you register on the site. How / when are exams graded? The online Learning Management System (LMS) grades exams instantly. Correct answers and reference information is provided for each question. Is there a passing score and final exams? None. Students taking CE courses are required to complete review modules, which are not scored. Does the TDLR charge additional fee's on top of your CE course base price? Yes. The TDLR charges a $5.00 per "Course Completion Record" fee for cosmetology and towing operator CE courses. This fee is included in your course price (Texas only).